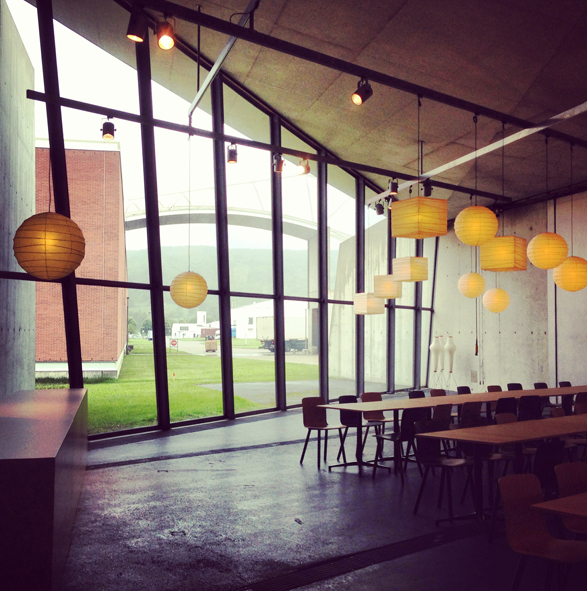 Last month, two of our team visited the wonderful Vitra campus in Weil am Rhein. If you’ve never visited before, we can highly recommend a summer jaunt to Switzerland to check it out. 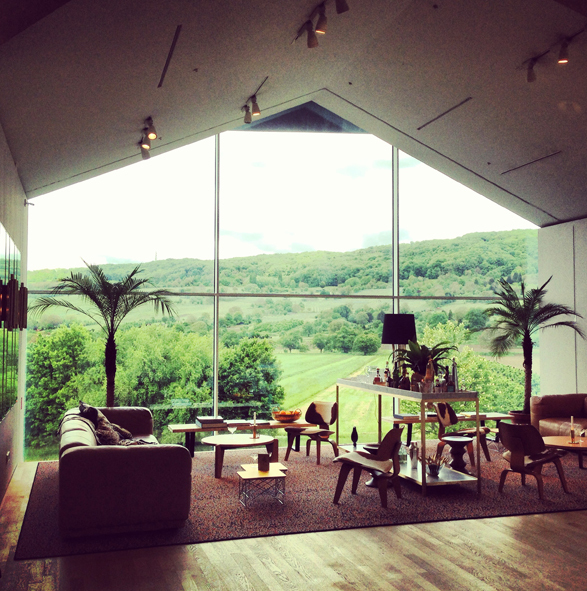 Set in the rolling hills just outside of Basel, this is a beautiful spot for both design and architecture lovers alike. As always, there was a fantastic range of products on show – all of which we were encouraged to interact with. However, the main feature that stood out for us was the breath and scale of the architecture on offer at the campus. 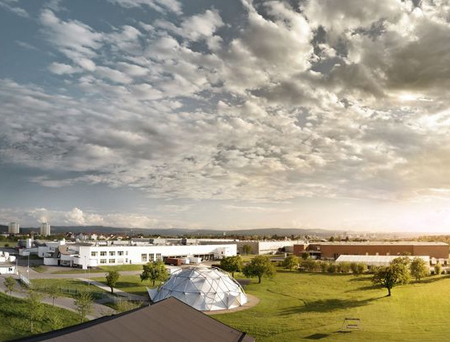 We’re all aware of the infamous silhouette of the ‘stacked’ Vitra Haus itself – the focal point of the campus designed by Herzog & Meuron. However, did you know the campus holds a number of other distinguished buildings? Designed by prolific designers both past and present, it was these architectural gems that really made the trip this time around. 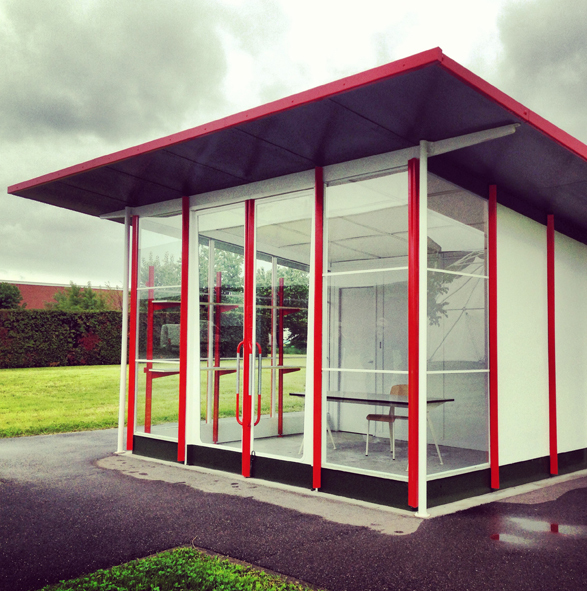 Despite being one of the smallest, our favourite building on site was the Petrol Station from Jean Prouvé. This structure, as you might expect from the French designer, is made from angular aluminium components and perforated metal sheeting. The building has qualities almost identical to the designer’s table designs and exemplifies his distinguished principles of production. Interestingly, on our tour of the campus, we were informed that the station is made up of singular parts that are all no larger than the door panel. A fascinating structure that, though small, intrigued us with its history. 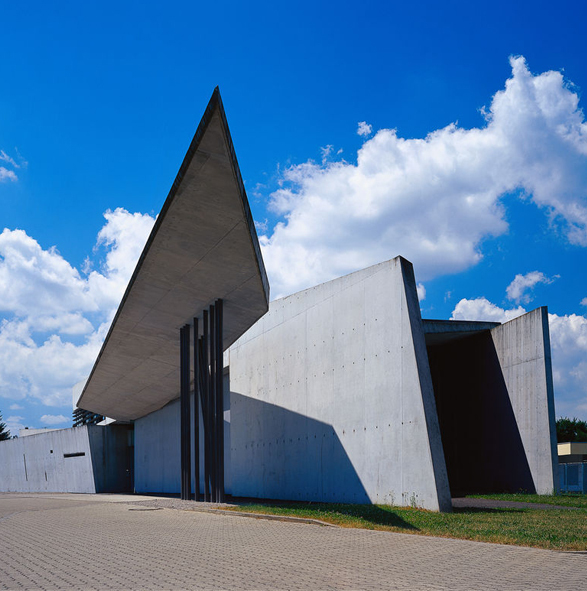 The second building that caught our attention was Zaha Hadid’s Fire Station. The structure, which celebrates its 20th anniversary this year, was actually initially commissioned in 1981 after a serious fire broke out on campus. 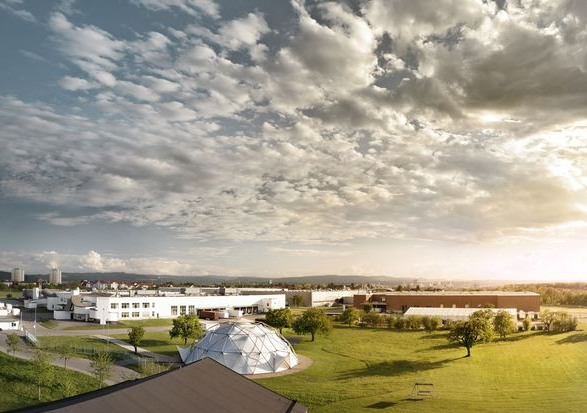 As the nearest fire station was over the hills in Basel, and therefore took a while to reach the campus, it was decided one needed to be on site. The Fire Station is the very first building complex designed by renowned architect Zaha Hadid and was cast in concrete on-site. The interior consists of spaces for fire engines, showers and changing rooms for the firemen as well as a conference room and a kitchenette. 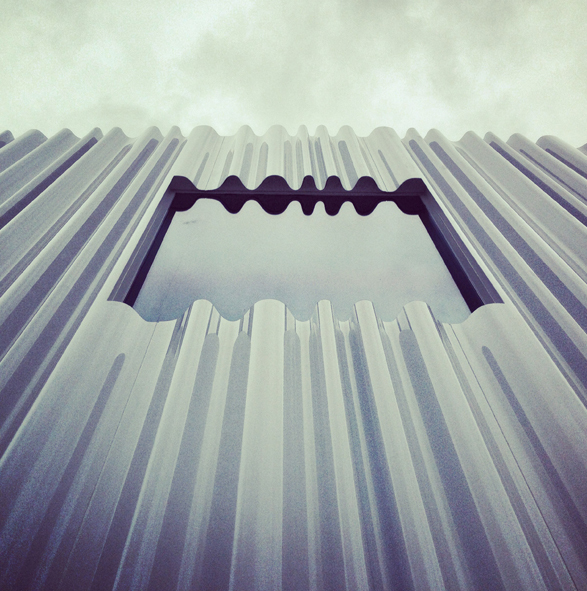 Though its stunning sculptural qualities dazzle from the outside, when inside, the station offers a whole new perspective. Its lack of colour and sharp right angles provide visitors with an unusual spatial experience – something that overwhelmed us at times. However, despite this, it is still a phenomenal design that contributes hugely to the impressive skyline. The Fire Station is now no longer needed as a working station and the building is used for conferences and events instead. The ceiling has been adorned with a varied collection of Akari Lights which provide a wonderful glow inside the dark, almost cold, interior. Next up on our architectural tour is the Conference Pavilion from self-taught Japanese architect, Tadao Ando. 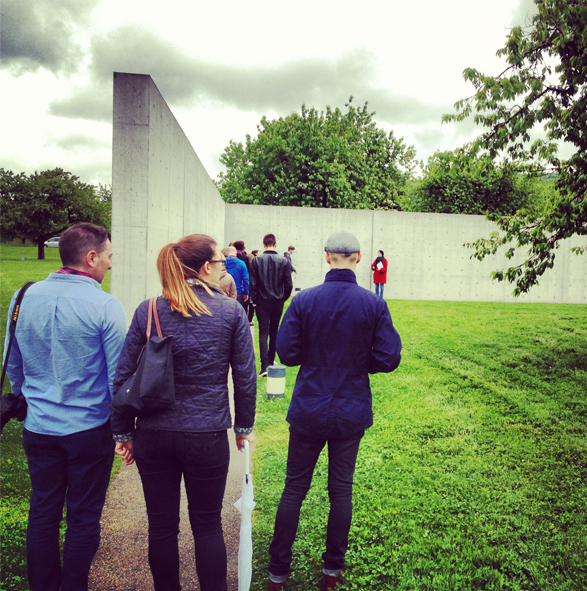 The most striking feature of this building is the 10ft high concrete wall that lines the path towards to building – something that was inspired by meditation paths in Japanese monasteries. The path was erected so that the walk around the beautiful gardens would have to be taken by all those entering the building, and also to block out the sound of the nearby road. Once inside, you are greeted with a vast array of greenery and foliage – a further extension of Tadao’s ambition of increase the presence of nature in an architectural structure. The Pavilion was the first building constructed by Ando outside of Japan and was erected in 1993. 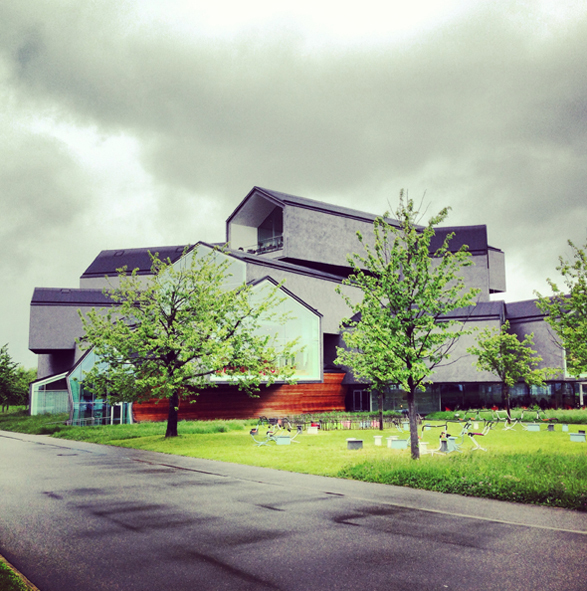 We’ve all seen the curvaceous form of Frank Gehry’s infamous Vitra Design Museum. This beautiful white building is constructed from a variation of bold, postmodern shapes – all of which are exemplary of the Canadian’s signature style. The Vitra Design Museum’s design was actually the precursor and ‘test’ design before Gehry’s masterpiece, the Guggenheim Museum Bilbao. 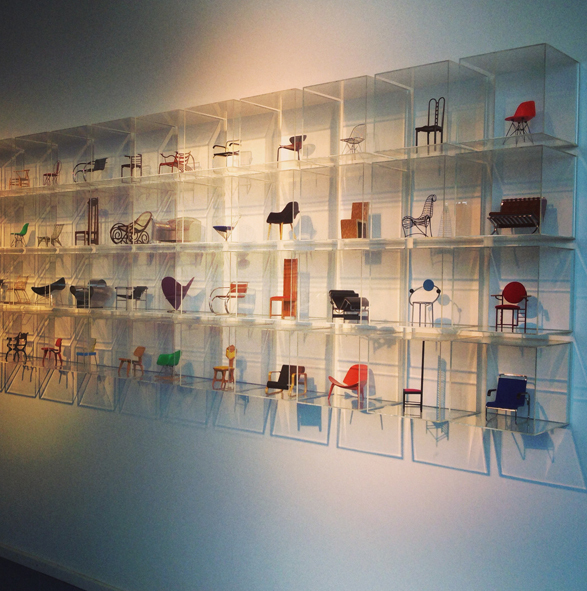 The museum houses Vitra’s furniture and lighting collection and has a plethora of wonderful displays – including this one below of the miniatures in their own Perspex boxes – we want them all! An unexpected highlight of our trip to the Weil Am Rhein campus was seeing the attention to detail in every aspect of the business. Even the factory buildings were well-thought out and designed. The Warehouse building was wrapped in corrugated white acrylic so that the building would be aesthetically pleasing to the nearby residents. 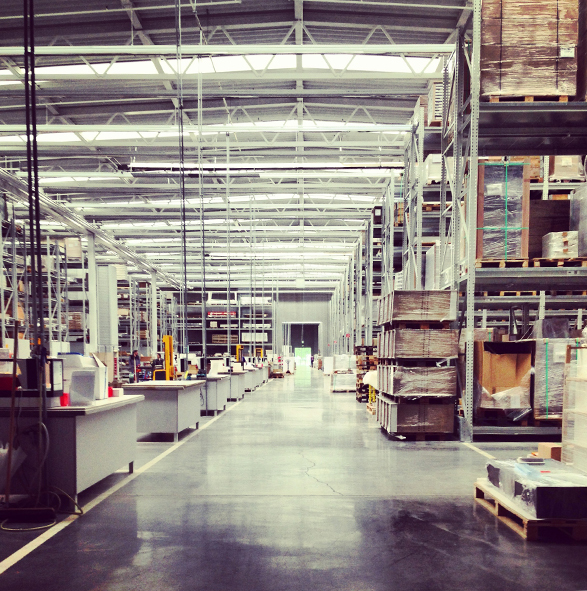 Furthermore, the warehouse, which was designed by Japanese studio SANAA, was incredibly well presented, organised and arranged on the inside. 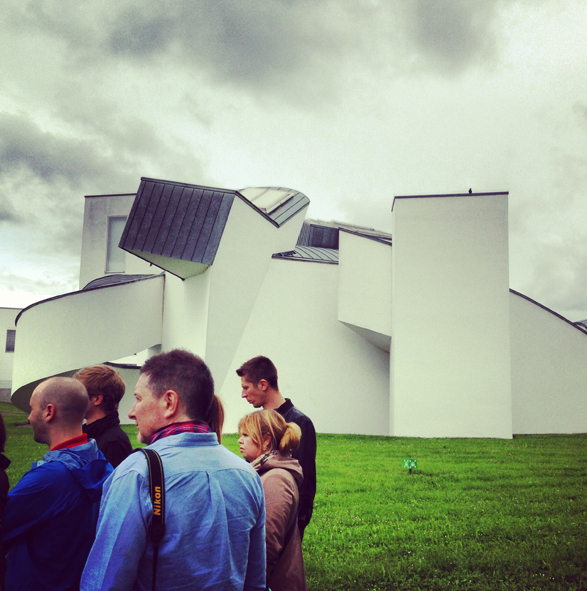 Last, but certainly not least, is the Vitra Haus – the central point of the campus. The impressive ‘stacked house’ consists of a number of separated structures, all of which represent different rooms in the home. The house is famed for its tall glass windows which allow for impressive views across the whole of the leafy campus. The inside of the house serves a number of purposes, but most importantly it is used as a stage-set to help the viewer find ideas and inspiration for their own home. We loved this house and it was the one we spent a considerable amount of time exploring. 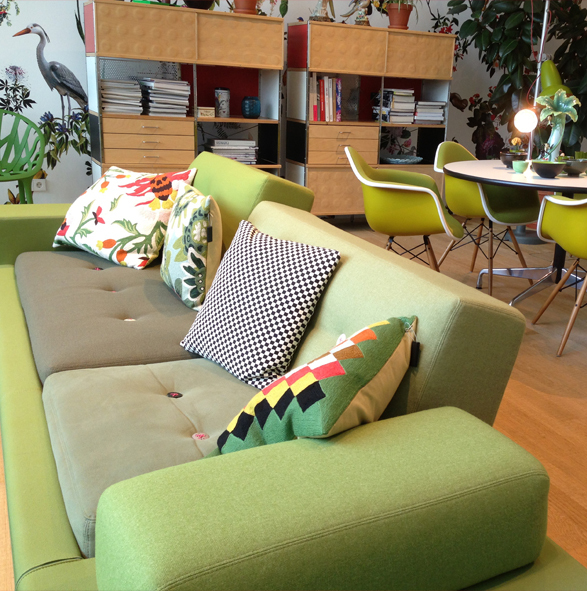 While its hard to get it all into one blog post, below are just a few of the scenes we saw inside the house – from the office spaces (a particular highlight for us – practical and hard working design! 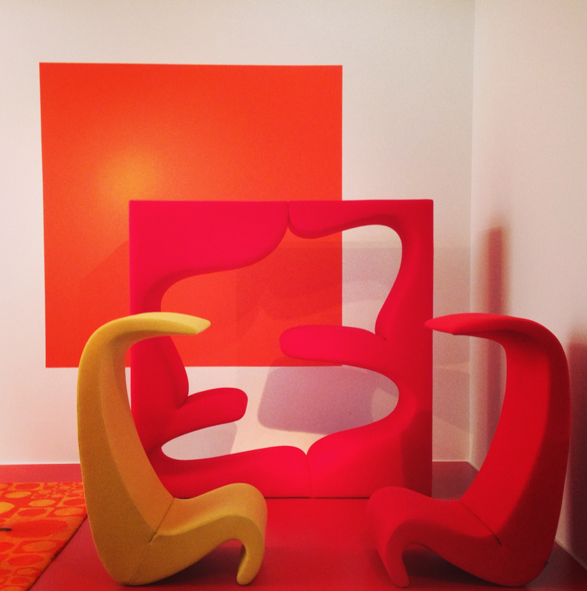 ), to the 60s colours and designs from Verner Panton, to the beautifully styled living room sets that we would have moved into straight away. 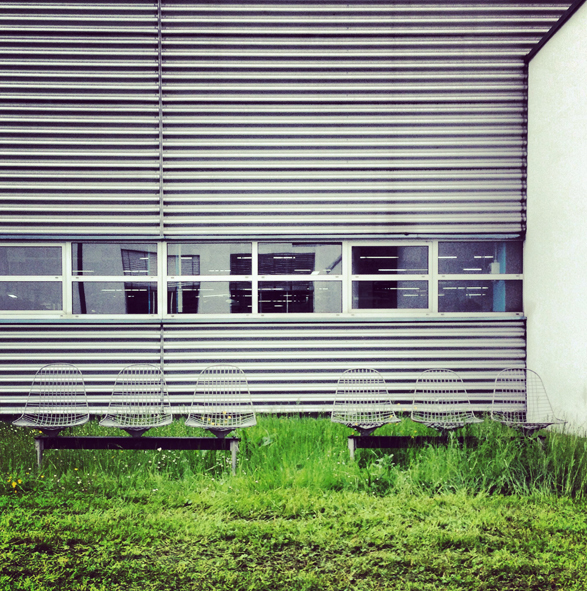 Finally, we couldn’t write a post on our trip to the Vitra campus without mentioning the über cool benches that were dotted around the site. 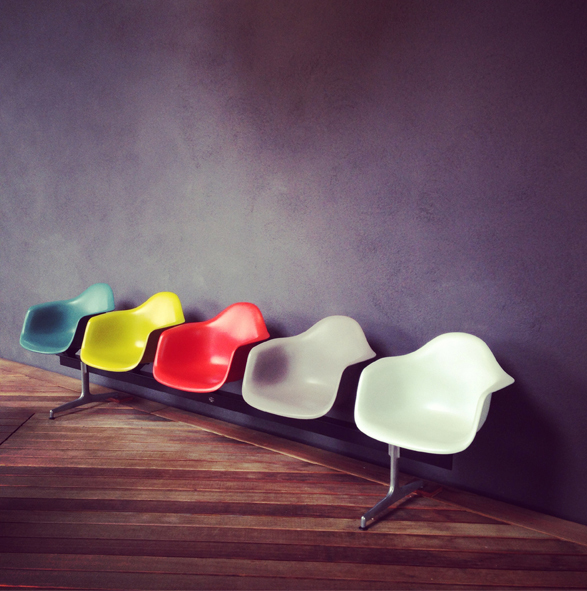 Constructed from iconic Eames chairs, these benches were located both inside and out and were a great place in which to stop, sit and admire the view. 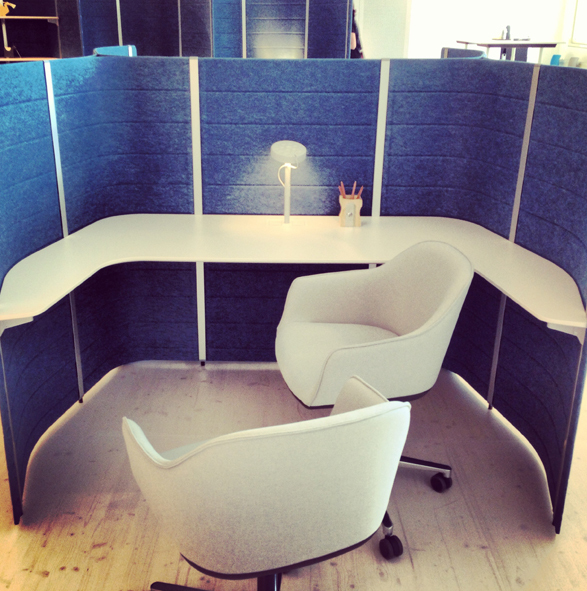 For more information on Vitra, and to buy their products, head over to our Vitra brand page.